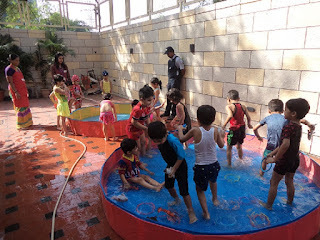 Water play is good for children's overall development …. physical, mental and socio-emotional growth. Children feel soothed and calm as they feel the water, hear the splashes and see the bubbles and waves . At the same time, they also learn many scientific concepts like sink and float, full and empty, wet and dry . In keeping with the theme of the month, children enjoyed playing with sea creature toys ,and literally had a , ‘whale of a time”!!! !